Activity and habits of fish are dictated by many variables. A rather basic approach will put you on fish and keep you there. I will cover how to find the most productive zones by species Now let’s look at Rainbow Trout as it applies to Lake Michigan and other ecosystems. 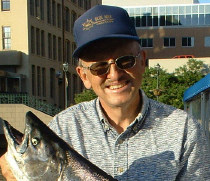 Last year was an above average year for Rainbow Trout on Lake Michigan Milwaukee. Wisconsin Lake Michigan holds the state record of over 27 pounds for this species. We boated many between fifteen and twenty pounds. 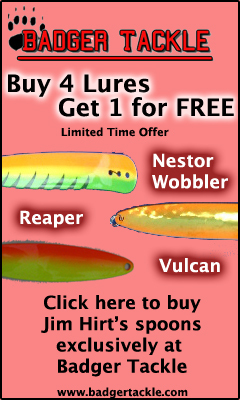 This fish can be elusive to some anglers; however, armed with the information in this article you will be on your way to many great outings of this tail-walking acrobat. Allow me to offer environmental preferences for this fish. Breaking each fish down by their preferences is the best way to find steady consistent action on any fish. When I am on a rainbow hunt, off shore is the place to be. It is smart to start trolling in about 50 feet of water and head out deeper. As action picks up you should note GPS, depth and temp info. This info will be your key to staying on fish. With the water in the forties don’t be surprised to find some huge fish in this cold water. When the bite slows troll back to your best GPS numbers. I have found that in deeper water fishing the surface is always better for monster bows all season long. April, May and June. Work the temp breaks and bugs for hot action. The top 25 feet where warm water has accumulated is the answer to your best numbers. Early May run your baits in the top twenty-five feet and progress to deeper in the water column as the water warms up. Anytime of day is a good time for them. I call them fish with banker’s hours 9 to 5 is the time to get them. Water temperature will dictate your best bait. I will break this down by temperature. All season long use crankbaits; minnow type lures and small spoons like the regular size Vulcan in silver or bright colors sold by Badger Tackle. Eight-inch flashers and dodgers with flies or squids are a staple as the water warms up to 60 and above. The distance between the attractor and the fly or squid will vary with the temp of the water. Try two to three times the length of the flasher or about sixteen up to twenty-four inches. Longer lead on the fly seems to work better in colder water. 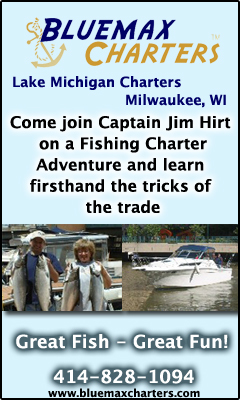 You may catch some fish on downriggers but they are not my first choice for presentation. Church Tackle Walleye Boards and leadcore are the way to go. I run three or more on each side of the boat working an area over three hundred feet wide. You should set up for rainbows with a 1,2,3,4,5 color leadcore. This will give you coverage from 5 to 25 feet. The Church Planer Board will run well off to the side of the boat out of your travel path.